The phenomenon is similar in other developed markets, the report found. The data, from the interim edition of the Ericsson Mobility Report, found that two-thirds of app data traffic on mobile networks comes from the top five apps in each country the report studied, with video streaming and social networking the most popular apps. In the U.S., Facebook was the most popular app in terms of traffic, accounting for 16 percent, while YouTube made up 15 percent, Netflix comprised 12 percent and Instagram and Snapchat each made up 9 percent. Ericsson ranked the top five apps by mobile traffic volume, according to data obtained by Mobidia. 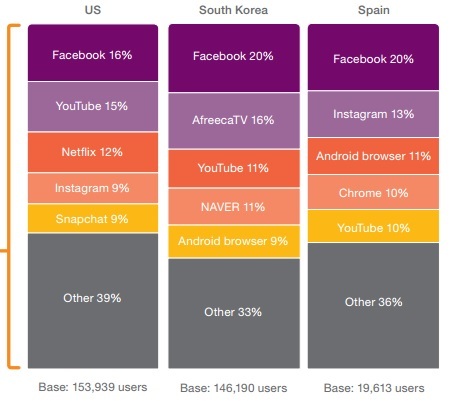 In South Korea, peer-to-peer TV app AfreecaTV, home-grown search portal NAVER and the Android browser cracked the top five alongside Facebook and YouTube. Meanwhile, in Spain, the Android browser and Chrome were in the top five alongside Facebook, Instagram and YouTube. In all three countries Facebook was the popular app in terms of traffic. The figures are based on an Ericsson analysis of Mobidia data from December 2014. Some implications of such findings are that carriers and network vendors might architect their networks around usage from the top-used apps even more so than they are already doing. Additionally, carriers might look to offer more zero-rating plans for popular apps, if they can strike deals with application or content providers. The findings of the report also offer a window into where Ericsson thinks most data traffic will come from in the next few years. The vendor found that 15 percent of mobile data traffic in 2014 came from social networking, a figure it predicts will be the same in 2020. Yet Ericsson is predicting a huge boom in mobile video traffic in the next five years. Ericsson also noted that traffic to and from social networking apps such as Facebook, Instagram and Snapchat already includes a significant portion of video traffic. In many mobile networks, Ericsson found that anywhere from 40 to 60 percent of video traffic is currently coming from YouTube. The company predicts that mobile video in general will grow by around 45 percent annually through to 2020, when it is expected to account for around 55 percent of all mobile data traffic. While prodigious in terms of a growth trajectory, that estimate is actually more conservative than one from Cisco, which said in a report earlier this month that it thinks that by 2019 mobile video will represent 72 percent of global mobile data traffic (up from 55 percent in 2014). Ericsson noted that video is increasingly becoming part of other online content including news, advertisements and social media, and that video streaming growth is primarily driven by over-the-top providers like YouTube and Netflix. Intuitively, the report also found that improvements in both mobile device screen quality and mobile network speeds as well as enhanced mobile video compression technologies are driving mobile video consumption. User behavior is also changing, resulting in video being consumed in larger quantities, when people are out of their homes or offices, and on all types of devices. Since 2011, Ericsson ConsumerLab has been studying nine countries, observing media behaviors and attitudes. In 2011, 83 percent of consumers in these countries watched broadcast TV several times a week, with 61 percent viewing streamed content on demand. However, according to Ericsson, today video/TV viewers are shifting towards easy-to-use, on-demand services that offer cross-platform access to content. The company found that 80 percent of those aged 16-45 streamed video several times a week in 2014. Ericsson predicts that in 2015 more people will watch streamed on demand video at least twice per week than broadcast TV. The figures are based on Ericsson’s ConsumerLab TV and Media report, which studied Brazil, China, Germany, South Korea, Spain, Sweden, Taiwan, the UK and the U.S.